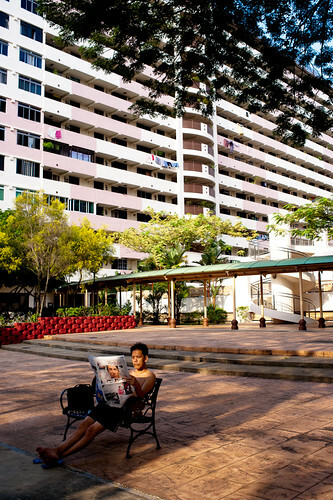 A man reads the newspaper in the morning light at the quiet and serene Ghim Moh Estate. 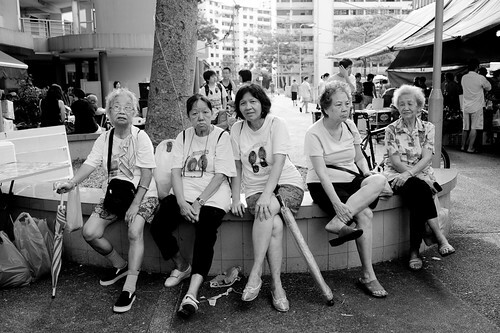 As we were finding a place to sit down in the market, I passed by this group of ladies sitting on the bench and took a photo of them. 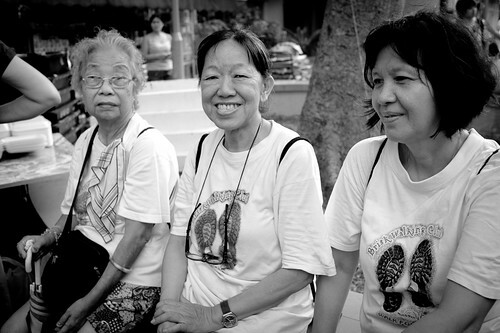 Two of them started to chat with me, and soon, the conversation turned to the railway tracks. They were happy that the young people (that’s us! ha! :)) of today are taking an interest in the KTM railway. The two of them said they have been walking along the tracks more than 20 years ago, when they were working as coolies carrying heavy loads. 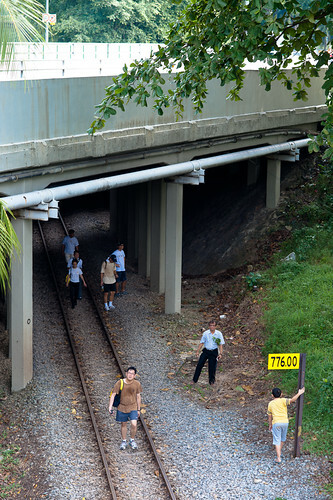 They would walk along the tracks while being wary of incoming trains traversing the tracks. It was indeed fortuitous to have met them and learnt of their story of the KTM tracks. After a hearty breakfast, we proceeded to a pedestrian overhead bridge from which we could overlook the tracks. 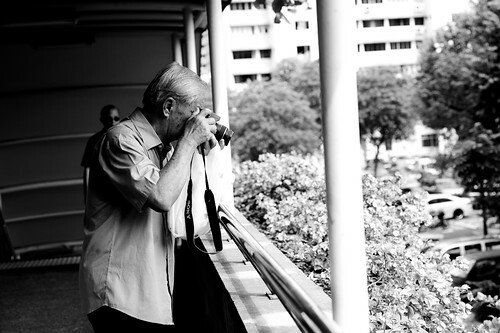 This elderly uncle surprised me when he suddenly whipped out a small camera and started to take pictures of the tracks – a few minutes ago he was carrying a plastic bag and walking slowly in front of me with no indication that he had any camera gear! 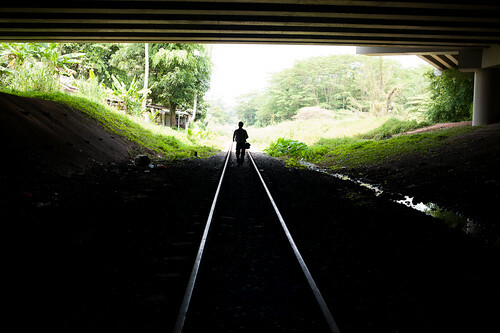 The second half of our walk thus begun with this shot of the KTM railway, with a couple holding hands walking into a sunlit spot of the tracks. 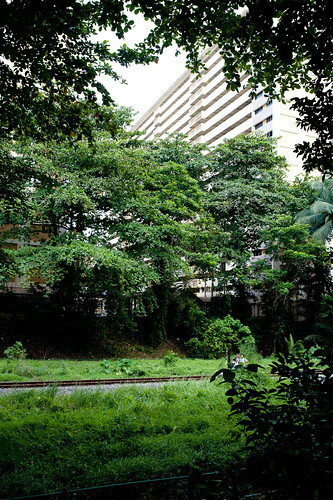 The canopy formed by trees framing a HDB block and part of the KTM track. 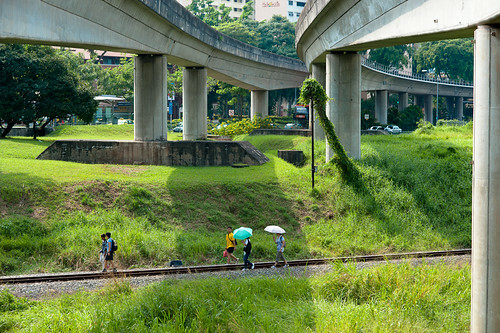 For this section, we were able to walk along the side of the main road alongside the tracks to give our feet some much needed respite. 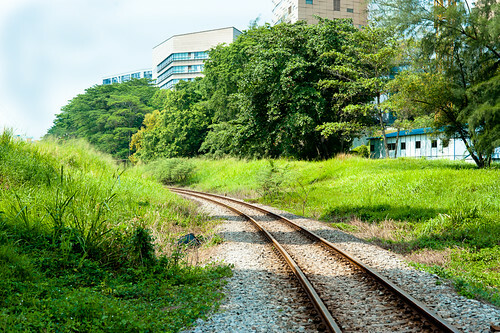 Walking along the road, we soon reached Buona Vista MRT, from where we can get an elevated view of the tracks, with the tracks of the newer Mass Rapid Transit trains running overhead. 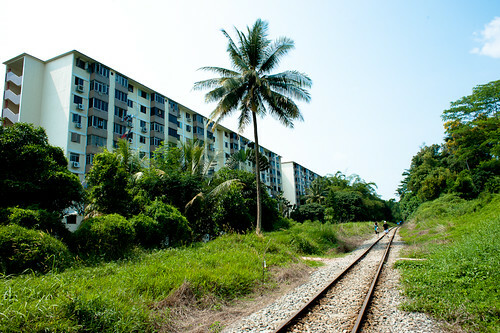 We found no way back down to the tracks from the MRT station, so we had to track back to the Holland village carpark area, from where we found a dirt path leading down back to the tracks. 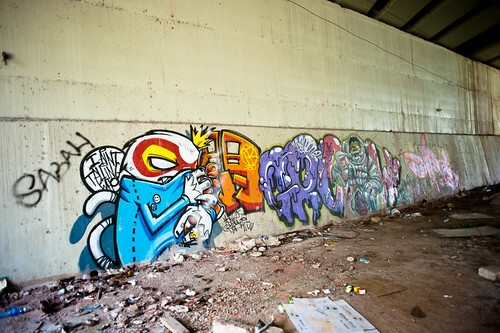 Very soon, we hit the first graffiti laden wall. The artwork is excellent and I really enjoyed looking at them. 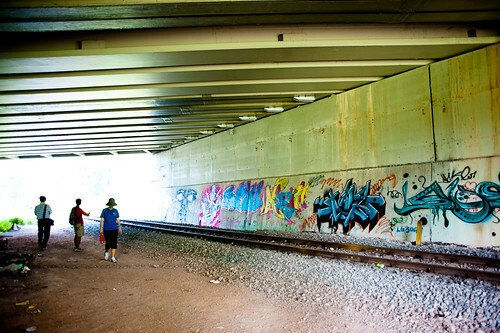 These areas, together with the tracks, should be preserved as a kind of an open gallery where photos, drawings and other creations can be openly displayed and showcased! 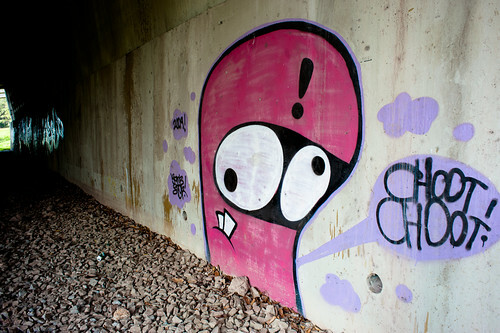 Who is the unknown artist / artists responsible for these great drawings? 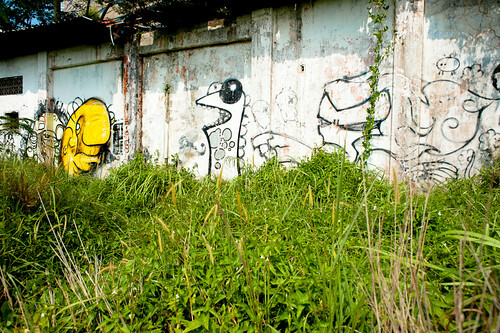 Filled with debris and litter, the area under the tunnel is dirty but the walls are adorned with colorful drawings that boggles the mind. Here’s another view of the walls on the other side of the tunnel. 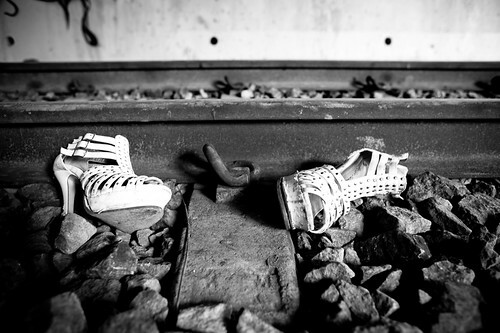 I found this abandoned pair of heels along the tracks. I wonder what happened to the owner? As we came out of the tunnel, a MRT train whizzed past on the tracks above the old KTM tracks, a case of the new superseding the old. 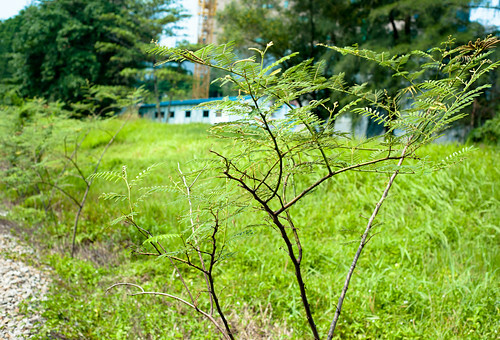 Continuing along the road, we have now the new Biopolis building on our right, the MRT tracks behind us, and greenery on the left. We are now walking in the heat of the mid afternoon sun without any shade. It was tough, but there were still a few surprises along the way! 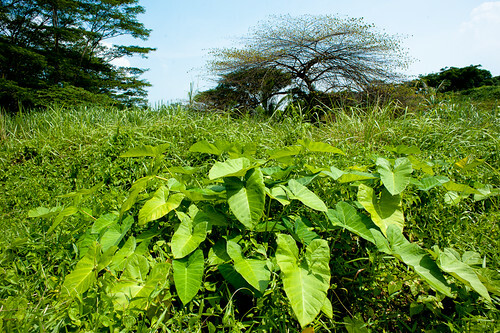 There's still time to check out the beauty of nature amidst the heat of the day. 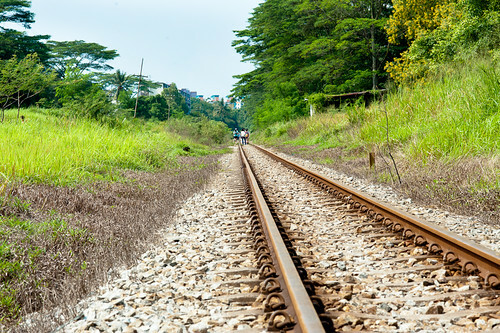 At times, the tracks seemed endless…..
We discovered an old abandoned house which used to serve as quarters for KTM workers along the tracks, which we suspected to be part of a former railway station along this segment of the KTM tracks. We discovered evidence of an old railway platform along the building. 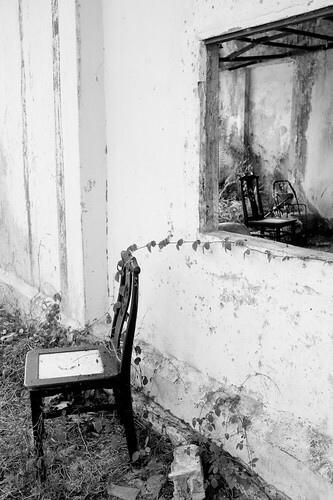 Interior of an abandoned house - only along KTM land will one find something like this in Singapore. A shaft of light waffles through an opening in the ceiling of the bedroom of the old abandoned house. 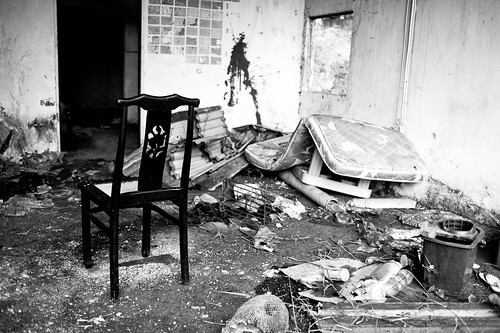 Two abandoned chairs, one inside and one outside the house. 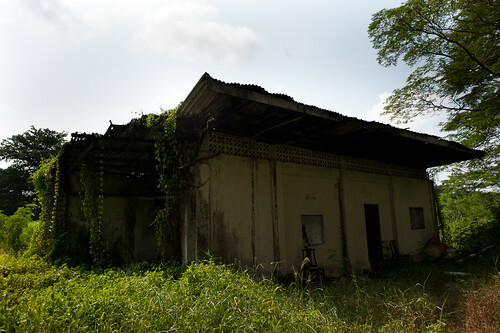 This is what the exterior of the KTM quarters looked like. 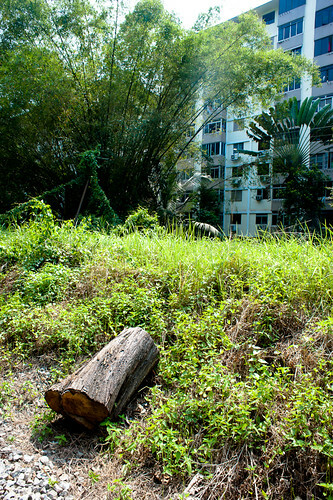 As we walked further towards the Commonwealth area, we saw a tall coconut tree which turns out to serve as a strategic marker for a shortcut that runs from the Commonwealth flats, across the tracks to a slope that will bring the user up to the Biopolis buildings. 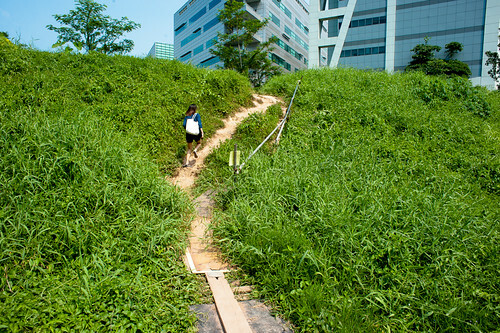 Here’s another view of the strategic shortcut, which was very well used, even during the short time we were there! A well used short cut - this is one popular well known route the local residents use. 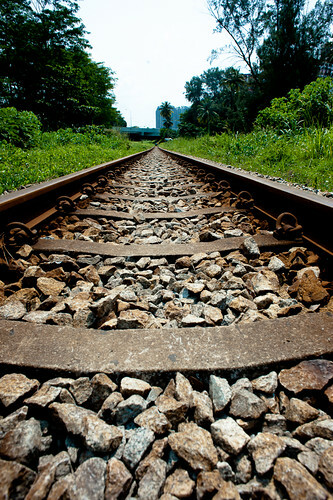 A little further up the tracks… with more interesting sights…. 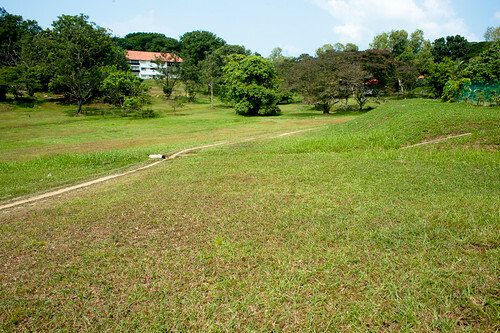 There was a path on our right which led to some colonial style houses offering what seems to be very tranquil and serene living. 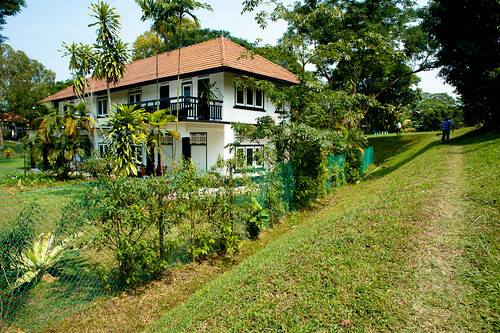 We walked about the estate a bit – this is very different from the usual Singapore style HDB living quarters, with plenty of space all around! After a short break at a coffeeshop along the Commonwealth flats, we pressed on further towards the Portsdown area. We are now quite near our final destination, and passed under another bridge. 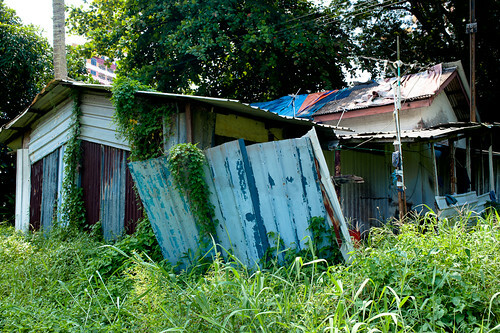 We found another abandoned old kampong style house along the tracks. 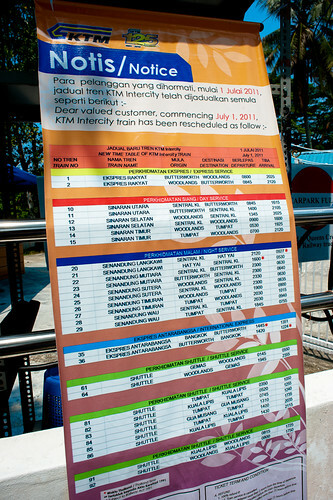 You don’t see things like this in Singapore anymore – unless of course you are on previously Malaysia-owned KTM land. It was here when I took one of my favorite images from the walk. I made a print of it and it’s now hanging on my wall. 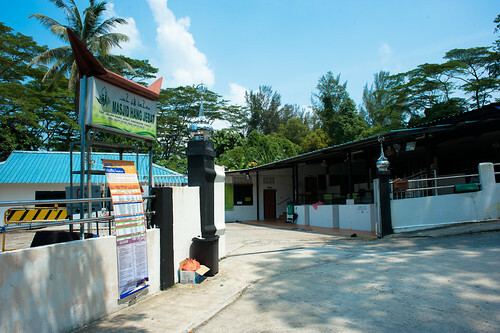 Very soon, we finally reached our destination – the mosque at Jalan Hang Jebat. We went in for a quick toilet break and that was when we noticed that the schedule of trains has been updated to reflect the fact that trains no longer run along these tracks. It has been a long and tough walk. 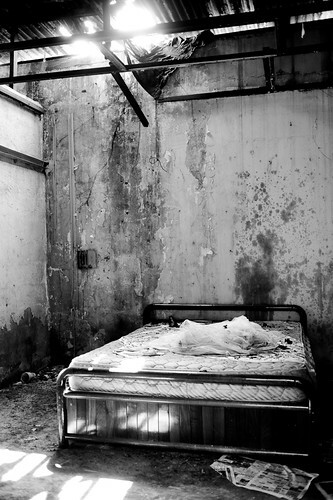 But at the end of the day, it was worth it, and it’s something that can never be repeated again. 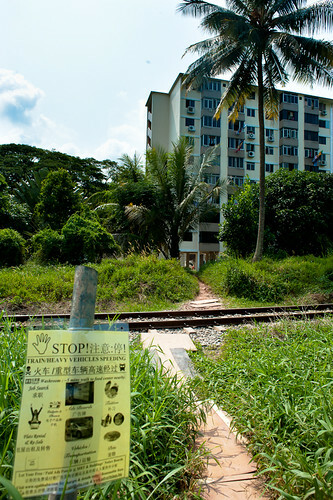 As of today, this whole path we walked would have been sealed up, and the tracks would be returned to Malaysia. It has been a long and tough walk. But at the end of the day, it was worth it, and it's something that can never be repeated again. 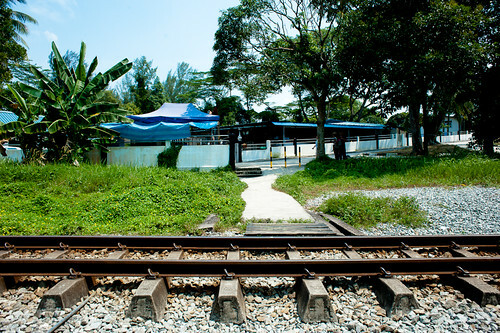 As of today, this whole path we walked would have been sealed up, and the tracks would be returned to Malaysia. 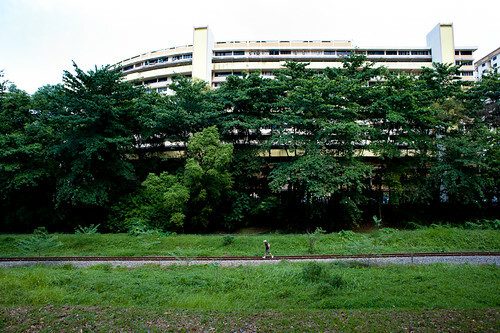 In the next post, I will finish up Part 5 of The Last Train, a 5 part series documenting the closure of the KTM railway station, where I will take a last look at Tanjong Pagar station. Hope you have enjoyed reaching about the walk and do feel free to leave your feedback below! Love the posts on the railway corridor. Can I ask a question? 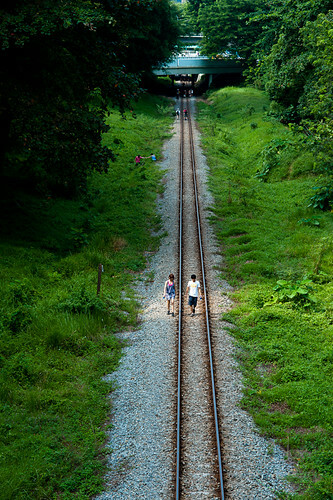 Would you know how long the distance is from the old Bukit Timah station to the old Tanjong Pagar Station is on foot? Anywhere I could find out the kms between the two stations?